Social-Emotional Development Games for kids can help children learn about their feelings and emotions. When toddlers, preschoolers, kids, and teens learn to understand their emotions they can begin to regulate their feelings and manage their anger. This collection of social-emotional activities and games for social-emotional learning can help children develop healthy social skills. Activities for emotional development can make all the difference to a child’s social and emotional health. Social-emotional activities can help children understand their feelings and learn how to express emotions in healthy ways. I have found in my many years as a teacher, childcare worker, therapist, and parent that children can learn to cope with their feelings and emotions much more effectively through social games and play. When toddlers, preschoolers, kids, and teens play social-emotional activities and social development games they are less likely to explode into tantrums and fits of rage. They will still get frustrated and angry, but the intensity and duration will decrease over time as they learn effective self-regulation skills and coping strategies to manage their anger. Reading books that help kids understand their feelings with our children, and playing social-emotional development games for kids like the ones listed below, are simple ways to help toddlers, preschoolers, elementary kids, and teens learn to navigate their emotional world. One of our favorite calm down strategies for kids is the use of sensory bottles. Click HERE to learn about sensory bottles and how to make your own calm down jars. Another easy way to help kids develop positive social skills and teach them how to express their emotions in healthy ways is to read books that help kids learn to manage anger. Click on the link to see our favorite recommendations. Playing social-emotional development games for kids is an effective way to help children understand their feelings and learn the social skills needed to regulate their emotions. When children understand their feelings they experience less stress and can begin to spend more time focusing on learning and academics. 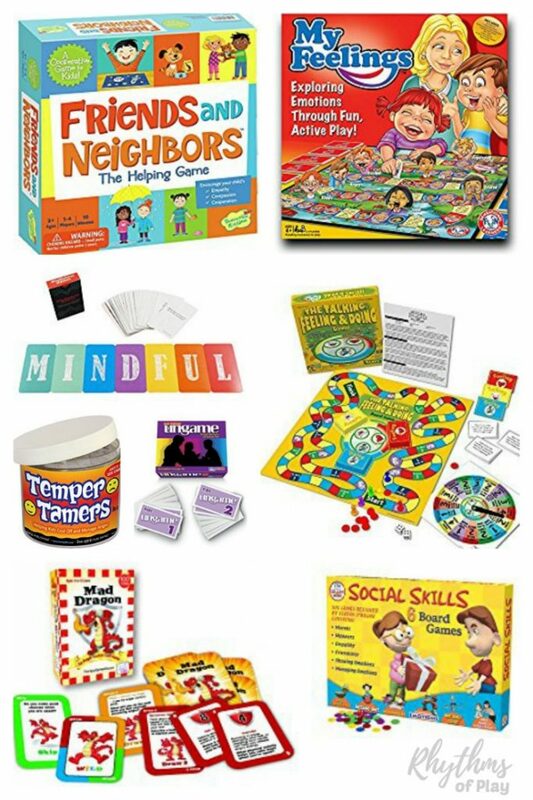 A collection of social-emotional games for children of all ages is listed below. Find the one that will work best for the ages of the children that you will be playing with. 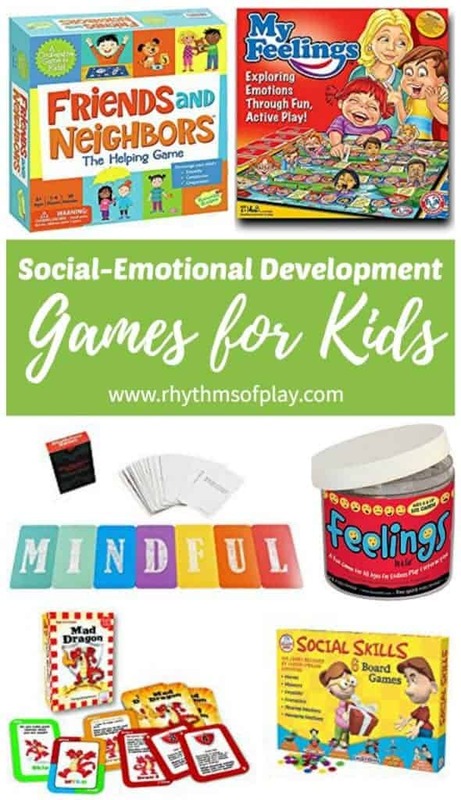 I have listed the social-emotional development games for kids below in the order of the manufacturer’s recommended ages to make it easy to find the best games for the ages of the children that you will be working with. Click on the title or the image of each game to learn more about it. Ages 4 months and up — Playing with these cards is a great way to get kids to talk about feelings and get to know other ways to express their emotions. Each feeling has two cards, so you can also play memory. Ages 3 and up — Feelings and Faces is a craft and game where children get to explore their feelings and the feelings of others through various everyday situations. A pretend play craft and game to encourage emotional development and introduce self-regulation while building social skills through play. Ages 3 and up — Friends and Neighbors is a matching game that focuses on emotions. Parents and educators can help their children recognize feelings in others while playing the game and reading about the feelings and needs of the characters. Ages 3 and up — Everyone needs to know how to name and express feelings. Each jar holds 365 little slips printed with “feelings words”—gleeful, insecure, grateful, angry, cranky, courageous, hopeful, and many more. Pull a slip and act out the feeling, or invite someone else to act out the emotion. Use as discussion starters, journaling prompts, or icebreakers for groups. Ages 3 and up — The classic game of picture matching. Flip over two cards and discover various facial expressions. Collect the most pairs to win! As they play, children will discover how to recognize feelings in themselves and in others. They’ll have way too much fun to realize that they’re developing the ability to understand emotions. Ages 4 and up — This game encourages you and your child to explore emotions in a fun, active and very silly way. You’ll gain insight while your child learns to recognize and manage his or her feelings in ways that are positive, calming, and socially appropriate. Ages 4 and up — A great game to get children to express, discuss and recognize their feelings and the feelings of others. There are four cards in each category and each person starts with four cards. The goal is to collect four cards with the same emotion, by explaining the emotion you have on your card. Ages 4 and up — This feeling-filled, multicultural deck has 28 pairs of high-quality cards demonstrating seven basic emotions (four different pairs each for happy, sad, surprised, scared, thoughtful, tired, and angry). Since the cards have no words on them, you can use them to show a wide range of emotions. Game ideas are included. Ages 5 and up — This kids version of the popular communication game is a perfect way for children to get together and talk about their emotions, feelings, and values. Designed for use in a variety of settings from the home to the classroom, the Ungame is a social game for developing communication skills that promote a non-competitive environment for self-expression. Ages 6 and up — This social-emotional game is really simple yet surprisingly effective in helping kids learn about their emotions and basic anger management strategies. If your kids like playing Uno, they will love this mad Dragon Uno with anger control tips to learn as they play. Ages 6 and up — A game to help impulsive children think before they act. Active children learn motor control, relaxation skills, how to express their feelings and how to problem-solve. Ages 7 and up — This game is a lovely way to start the process of helping children to identify and expand upon their feelings vocabulary. Playing this game can also help kids identify the feelings they have in response to certain situations. Ages 7 and up — There are no right or wrong answers in these six unique social emotional development games. Each social game has players discuss the solutions to socially challenging situations. Together the Group decides upon the best action encouraging all players to communicate, listen and participate in the game. These games will encourage your students to work together as they learn to improve their social skills. Ages 8 and up — Playing this social skills game is a great way to engage kids in a discussion about anger and help them adopt new self-regulation strategies to deal with their angry thoughts and feelings. The cards each offer tips, open-ended questions, and social scenarios to act out. Ages 9 and up — Mindfulness Matters teaches and engages children and teens in critical mindfulness skills. Players learn different mindfulness techniques and how to apply them in their everyday lives. Gameplay is cooperative to enhance social skills, social learning, and social development. Ages 12 and up — Play this game to help kids learn healthy ways to manage anger and cage their rage. Playing this game can help children and teens deal positively with anger and maintain respectful relationships. Social-emotional activities and social-emotional games for kids can help toddlers, preschoolers, elementary aged kids, and teens begin to understand and learn about their feelings. Understanding our feelings and accepting our emotions is the first step in learning to regulate them. When children begin to understand their emotions and learn how to express them in healthy ways it can reduce emotional outbursts. Another easy way to teach kids how to express their emotions in healthy ways is to read kids’ books that help them understand their feelings and books that help kids learn to manage anger. Click on the link to see our list of recommendations. You may also like this awesome collection of books that teach kids important life lessons, and these popular board games. Learn more about Rhythms of Play HERE.